Si and Am look over the grizly crime scene and see the little white kitten they had gown fond of. It seemed this killer didn't like any felines at all. They were starting to get worried they would be next. They slowly left the area where the body was and headed back to the dinning area. Ooc finally arrived after a 22 hour drive? As the others run off toward the screams of Ursula, Dr Doofenshmirtz lingers behind.. he has decided that some how or another that trophy will be his. He slowly sneaks toward his prize. "I hope you are looking for clues....if you get my POINT." Turbo heard Scar say something to Doof, he glanced over to see what was going on... it seemed Scar had apprehended him trying to take the trophy... HIS trophy. The racer walked over to Doof and Scar; looking pretty annoyed. "Don't even THINK about it! Aha! Even if you did somehow take it... I would just get it back from you... very... very... VIOLENTLY! Ehehehe!" Turbo smiled, and then looked at Scar. "It seems my celebratory dinner has gone to the cats as it were... how is this to be rectified exactly? Though, aha! I do thank you for stopping Doof-whatever," He muttered with a smirk... though he was pretty annoyed the race results had been put on hold... again... and the fact this murder had kind of stolen his thunder... but Turbo was trying to suppress his rage as this was a rather serious situation. "When we did a review with a photo finish it was clear that your antenaes were first to cross the finish line. This makes you the winner. Not Doofus or Cavity man here. Here is your trophy." OOC* The post count has ended and I am doing a check now. Turbo's jaw dropped in shock at the name on the trophy. "Wha... Cri-kee was a passenger... he can't be the winner... I was driving..." He said to Scar, a very concerned expression on his face, after all Turbo had not noticed Cri-kee trying to help him win during the race. "Usually, Scar... the driver of the car gets the trophy, aha... yes," To be honest, Turbo didn't know how to feel about this... he was severely disappointed the trophy did not read 'King Candy'; but he couldn't bring himself to rage against Cri-kee... who seemed to be his only friend in this case. This was unique in Turbo's racing history; he had always been incredibly angry whenever he lost... which was rarely indeed. He could of yelled at Cri-kee for stealing his spotlight... but he just knew the cricket had been trying to help him win. And for once... just this once... Turbo swallowed his pride, and forced a smile... which ended up looking quite frightening as his lips pulled back quite a lot, revealing nearly all of his yellow teeth. He stood there with that expression for quite a while... the jealousy was there... and suppressing it was not easy. Cri-kee hops to the room and sees Marie on the platter. The look on Marie's face meant that she was in writhing pain throughout the whole ordeal. Cri-kee saw the body and had a sad look on his face. He had seen skinned animals before when Mulan's Grandma took him to the marketplace, so it was not anything new to him. He starts to sketch the whole thing in the scroll, and he wrote down the note as Ursula read it to the detectives. He had never heard of the word "rent-a-cop" before, so Cri-kee underlines that into his scroll. Cri-kee notices Si & Am leaving the scene, and he thought to himself about the possibility of that being their fate. Cri-kee shakes the thought out of his head and continues sketching. As he puts away his scroll, he hears Scar calling to him in the other room. He hops towards Scar, who has the trophy right next to him. He hears Vanellope start to follow him. Scar turns the trophy around to reveal the nameplate on it. It read "Cri-kee." Cri-kee's jaw drops to the floor. He hops over to the trophy to admire its shine. He had never won anything before, and he starts to think of Mushu's face when he sees Cri-kee with the trophy. 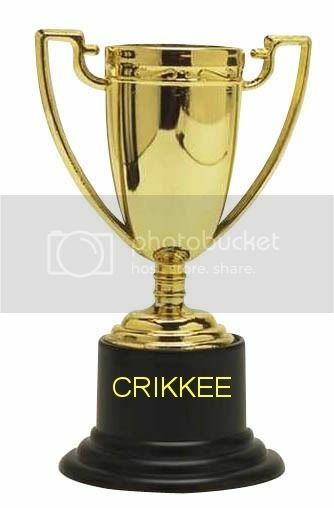 Cri-kee hops onto the top of the trophy to reveal a deep hollow interior. Cri-kee closes his eyes, and he starts to think of tea being poured into the trophy and having it become his own personal swimming pool. Cri-kee opens his eyes and sees Vanellope, who was laughing and clapping at the same time. He turns to see Dr. Doofenschmirtz, who seemed to have an angry and frightened look on his face. Finally, he sees King Candy/Turbo giving him a frightening smile. Cri-kee remembers his whole intentions of being in the race: finding the secret guest and helping King Candy win. He starts to look down, thinking about disappointing King Candy. Cri-kee suddenly looks up and smiles. Cri-kee takes out his scroll, rips a piece of it off, and starts to scribble something fancily on it. He turns the piece and licks it. He then hops to the bottom of the trophy and towards the nameplate. He sticks the piece of paper on the bottom of his name. He then pushes the trophy towards King Candy. The nameplate now reads "Cri-kee and King Candy." Cri-kee looks up towards King Candy's face and smiles. From the reflection of the trophy, Cri-kee stops his smile and sees Si & Am creeping closer behind him. Cri-kee hops into the trophy and hides in the interior. Turbo's smile didn't fade when he heard Vanellope laughing and clapping for Cri-kee. The jealousy was building... the same jealousy and anger that had caused him to abandon his own game and try to take over RoadBlasters back in 1987. He was just about to rage when Cri-kee stuck a piece of paper on the trophy, so it now read that they both won. Turbo's anger began to subside, his grin faded and his expression became one of subtle confusion... Turbo could not understand why Cri-kee would want to share victory; but he also felt quite touched by the cricket's kindness. Turbo closed his eyes, the dark rims even more apparent when he did as his eyelids were the same... giving him an almost dead looking appearance, and he sighed... deciding he would share victory this one time. "Thank you, Cri-kee," He said, looking back at the cricket; obviously Vanellope was quite shocked that Turbo had not tried to kill Cri-kee. Soon he noticed Si and Am walking up and the cricket hiding in the trophy, so he picked it up and shot a glare at the pair of them. Turbo then gave Cri-kee a tumbs up. "We won! Turbo-tastic!" He declared, saying his signature phrase from TurboTime. He then grinned smugly at Doof. "How does it feel to be the loser, Doof-whatever!? Ehehehe!" After the terrible comment about Marie, Alice couldnâ€™t take it anymore and decided to run off where she could have some privacy. So she ran off crying to the nearest room, the kitchen. 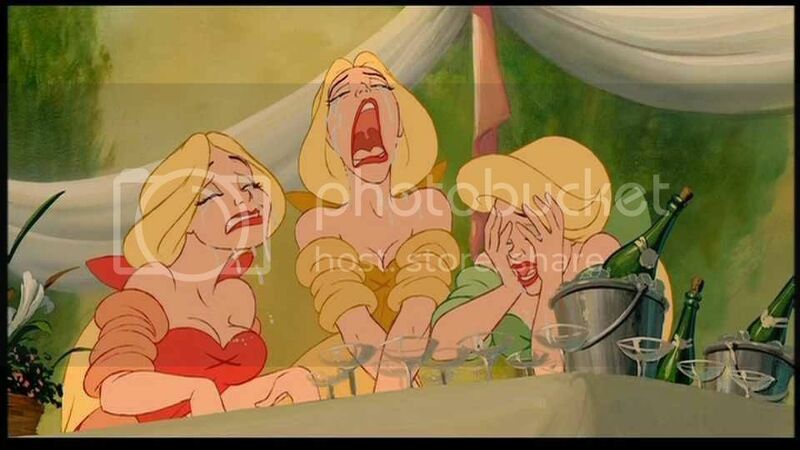 Now with her tears out of her eyes, she remembered that a lady should always be strong and brave during hard times. So wishing for a hot cup of tea she went further into the kitchen to try to find some tea bags. She regretted her choice instantly. On the floor were pieces of white fur, some painted red like those roses, and as she continued she saw more white fur covered with more and more blood. There on a kitchen counter was a knife and more fur, completely covered with blood. This is where it had happened. This is where Marie had her last moments. She screamed and ran off to tell everyone but the moment she opened the door she saw them all busy with the race winner. She was angry. Had no one cared about Marie? She was such a sweet lady and it seemed like only she cared. Aliceâ€™s eyes began to get teary again and not wanting everyone to see her cry again she simply said, â€œshe died in the kitchen,â€ and closed the door behind her and went towards the counter, still in her bigger size. When Vanellope hears Scar call out Cri-kee's name, she glances out and sees Scar, along with Dr. Doof and Turbo, standing by the trophy. Curious, she follows Cri-kee out of the room. At least this would distract her from the body. When Scar turns the trophy around to see Cri-kee's name on it, Vanellope couldn't help but start laughing and clapping at the same time. Laughing because Turbo didn't win, but clapping because she was happy for Cri-kee. What happened next really surprised her. Instead of trying to kill the cricket, Turbo actually smiled at him. A creepy, forced, almost unsettling smile, but a smile nonetheless. She was even more surprised when Cri-kee decided to share the trophy, putting both his name and King Candy's name on the nameplate. I hope that cricket knows what he's doing, becoming friends with him, she thinks to herself. Usually the only time Turbo/King Candy became friends with someone was because he using them. Cri-kee looked up from inside the trophy and saw that King Candy shooed Si & Am away. He looked at King Candy and grinned as they started to celebrate. The celebration had stopped as soon as they saw a Giant Alice in the room, telling them about Marie's death being in the kitchen. King Candy held the trophy firmly and took Cri-kee and the trophy into the kitchen. Cri-kee looked at the scene, seeing white fur and blood on the floor. He then spots the blood-drenched knife on the counter. Cri-kee took out his scroll and started to sketch out the scene and took some notes. Cri-kee felt King Candy put the trophy down on a clean part of the floor, still right next to him, so that King Candy could take notes. Cri-kee looks up to see Alice still giant. I know humans are big, but she turned gigantic! How did she get big? Cri-kee sees Alice about to cry. He notices that her tear drops looked like the size of horses. I hope she does not flood the kitchen and tamper the crime scene. Turbo was surprised when the now rather tall Alice started shouting at them; he frowned. "Excuse me, aha... a race is much more than a game..." He stated in a matter of fact kind of way. "But good for you if you found a clue..." Turbo said coldly; he noticed Vanellope giving him a suspicious look, she didn't trust him to actually be friends with another without manipulating them he guessed. He just gave her the same smug expression he had given Doof. To be honest, he himself was unsure on why he wanted to keep his and Cri-kee's friendship intact. With that Turbo went into the kitchen, still holding the trophy and Cri-kee, to inspect where the murder had taken place; after this he had an idea of how to get his King Candy code switched on again... so was quite happy. He then saw the bloody scene ... my... was it a mess! "Oh dear! That poor Marie... now if only they had killed Vanellope instead; then none of us would get annoyed by her... ahaahaha!" He giggled to himself and set the trophy down on the floor, making sure to keep an eye on it though, before writing in the new evidence in his notebook. "Scaaaaar... you might want to come in heeeeeere~!" Turbo almost sung, the racer waited for the others; noticing Alice crying. "Do pull yourself together," He muttered. "Well at least we have a few numbers to replace the ones killed off..."
Alice couldn’t help but cry, after all Marie was such a great lady, something she hoped to be one day, and she thought of her own cat, Dinah, and she didn’t wish death on anyone – feline or not. When everyone started gathering around the kitchen, she noticed Ursula had shined a bright light on her and she grew down a slightly smaller size but still not her true height. She was glad too because with the rude comments by that king candy racer guy, she had thought about stomping him with her large foot. Each Alice in unison, without realizing that there were three of her now, said: “You’re lucky you’re not in your game because I wouldn’t mind deleting you all together!” With that, each Alice, still unaware of each other grabbed the piece from her left pocket and took a bite. Instantly she shrank and shrank, until being the size of the cricket and landed on the kitchen counter, where the unspeakable act had happened. Once she landed, they each noticed one another. They screamed and ran around the counter, careful to avoid blood and fur and during that tiny chaos that most were unable to see, except for the laughing cricket on the counter, is when one Alice found something. Ursula hesitated but knowing too well that they were all here to help clear her name she lifted her amulet again and said: “Only because you asked so nicely, but comport yourself young girl. Next time, you won’t catch me in such a forgiving mood.” In an instant, the two tiny Alices disappeared and now Alice stood back to her original size. OOC: (EDIT was for this comment!) Hopefully you don't mind me borrowing Ursula! And that is a clue guys ! This game is so much fun! Turbo had a fit of giggles when Ursula created three Alices; "I said pull yourself together... and you've gone and done the opposite! Ehehehe!" But when Alice threatened him, he laughed even more! "Oh that's rich! Aha! You have no idea how to reprogram a video game... and do not understand code... ehehe! Silly... very silly..." Turbo was slightly surprised though when all three shrunk down to a very small size and ran around screaming on the counter. "That... was... random..." He muttered; but it seemed Alice had found a clue and grew again, now this was getting bothersome! "Okay, will you stop changing your size! Its highly annoying!" Turbo shouted just as Ursula changed Alice back to just being one person. The racer frowned and decided to focus on the clue that had been found... a piece of leather; he wrote this down in his notebook, he had quite a few theories about this case by now... but was not about to mention them just yet. Cri-kee hopped onto the counter to get a closer look at the knife. He started jotting down notes when a shining light appeared, and three Alice's appeared. He was surprised that the Alice's did not notice each other at first. Suddenly, the Alice's took out something from their pockets and started to eat it. They suddenly shrank to Cri-kee's size. He sees them noticing each other and running around in a panic. This caused Cri-kee to laugh. He wasn't sure if he wanted to go down there or to stay on the counter. He sees one of the Alice's picking up something stuck in between the knife and the cutting board. It was a piece of leather. Cri-kee quickly jotted down the clue and contemplated on who the suspect could be. He had his suspicions, but he still needed more clues to solidify it. As he jotted his notes down, he noticed that the Alice's grew again, and that Ursula had turned her back into one regular sized Alice. It seemed that all these happenings kept Alice from crying and flooding the scene. Cri-kee hops back into his trophy and waits for Scar to come in. Cri-kee stares at Ursula, trying to figure out why this murder was so close to Ursula's location. He then wonders about the park guest and who he was in all of this. Cri-kee decides to look back to his notes as he waits for Scar to speak. OOC: I would have loved to be a part of these games sooner too! I just love it! Haha. Vanellope was shocked when a giant Alice came in and started yelling at them about caring more about the race than Marie. It wasn't that Vanellope wasn't upset about Marie. She really was, but she knew that finding out who won would help distract her from the grisly scene. When Alice told everyone that Marie had been killed in the kitchen, Vanellope makes her way in there with the others. The scene in the kitchen was horrific to say the least. Blood and white fur was everywhere. "Ugh..." she mumbled, starting to feel a little sick. There was only so much a kid could take in one day. She frowned at Turbo's comment about her dying instead of Marie. "Don't worry, I plan on being around for a looooong time," she replied, dragging out the word long. Things started to get stranger when Ursula split Alice into three different people. Then she grabbed something from her pocket, ate it, then shrank in size. Vanellope kept her eyes on the three Alice's, wondering what she was doing. Suddenly, Alice ate something from her other pocket and grew close to her original size. She pointed to a piece of leather that was stuck between the cutting board and the knife. Vanellope gets out her notepad and writes down the clue. "Good job Alice. I am glad that someone is trying to clear my sweetcakes name." 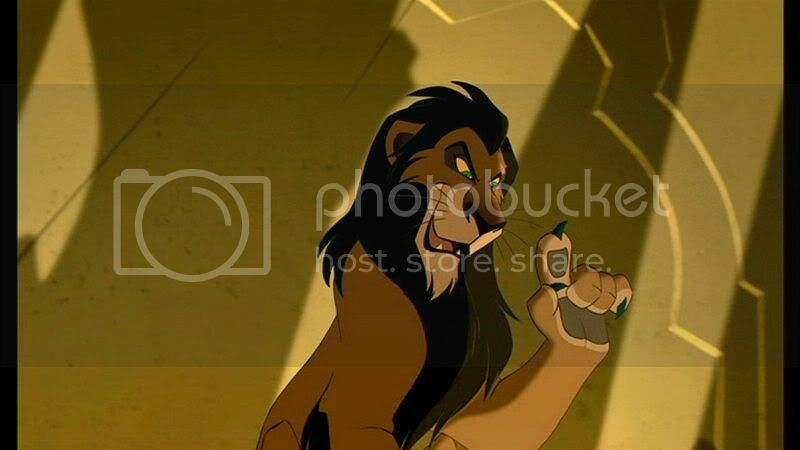 *Just then a staff member from the restaurant walks over and whispers in Scar's ear. Scar turns to her in surprise. * "Really, so soon?" "Everyone may I have your attention. It seems like another crime scene is under need of investigation. Chessie will you please tape off this area and close down the restaurant for cleaning and until Marie's body can be picked up. The rest of you follow me over to the Tower of Terror. Oh and Alice you can take that leather to the DFI lab in the SS Columbia since it's right next door to the Hightower Hotel." OOC* Don't forget to ask your trivia question so that I can work the answer into the game. Turbo rolled his eyes at Scar calling Ursula 'sweetcakes'; it just sounded so odd coming from him. "That was quick..." Turbo sighed; he had wanted to try out his idea to get his King Candy code switched back on but it seems they now had to relocate to the Tower of Terror. The racer put away his notebook (good thing his racing outfit actually had pockets!) and picked up the trophy again, putting Cri-kee back in it at the same time. "I do hope soon I will get a moment to sort out my code!" He stated before leaving the restaurant and going to his car, ignoring Scar's request for everyone to follow him and deciding to make his way there himself. "Cri-kee, I'm going to put the trophy in my car, aha! It will be safe there from Doof-whatever..." Turbo picked Cri-kee up again and placed him on his helmet before putting the trophy in the car's boot. He then got back in his car and drove off toward the Tower. "I wonder who was killed this time? Yes. I bet its another one of us, aha! They don't like us much, eh, Cri-kee? Shame. I am amazing! Ehehe!" Turbo grinned as they arrived at the tower, obviously a bit before everyone else as he had driven there. Turbo decided to wait outside for the others to arrive... he had been getting fed up of following orders from Scar. Vanellope giggled when Scar called Ursula sweetcakes. It reminded her off when Felix and Calhoun started giving each other nicknames like that. Sure, she gave Ralph nicknames and vice versa, but they were doing it jokingly. She sighed when Scar announced there was another crime scene, this time by the Tower of Terror. Vanellope really hoped it wasn't another body. She didn't know how many more she could see before she went crazy. Vanellope puts away her notepad and follows Scar and the others to the new crime scene. What a day, and it's only just after lunchtime! Diablo can't believe all the chaos he's seen today. A cricket winning a race trophy, a growing, shrinking, and multiplying girl, that yelling King suddenly acting nice, and of course... another clue! Now what villain, he tries to think, would either have or spend time with someone who has fur, and a piece of leather, and... oh dear. He wonders whether the cricket might share his notes. *Ursula reluctantly tuned the Aliices back into unison, she had to appreciate at least someone was sincerely helping her. Gods only know why magic was easier with an equivalent exchange. As Scar announced there was another crime scene at the Hillwood Tower, she came up beside Scar, and clutching tentacle and paw, accompanied him out of the kitchen. Back in the main Dining room, Wally came out of his glassy eyed stupor. Looking down at his watch, he noted it was time for his reservation. Seeing the room was void of guests, he sat down and hoped a CM would be wirh him shortly.